Easy drive to the mountain! Perfect day for it! Sunny and 30’s. Crazy gorgeous. The skiiers had a great day. Nice 5K course. 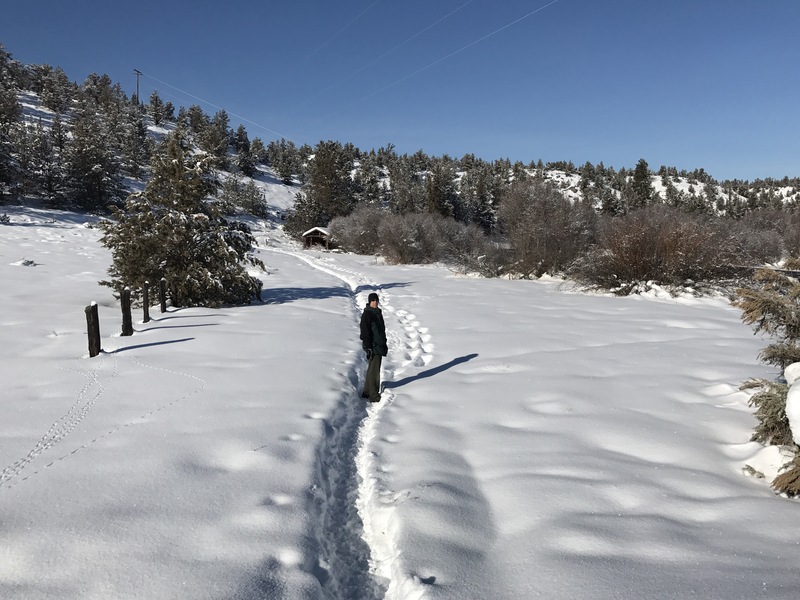 I strapped on my snowshoes to get some exercise, but should have strapped on skis and done the course – next time! That lucky skier ! Look at that, he’s got the whole hill! Just another day in paradise. Eliza had a Nordic race at Hoodoo today and when I got on the road at 9 am , it was just starting to snow hard . Again ! Easier driving than the past few days , and through my favorite trees . Eliza and the best uncle ever who came to watch her race ! At 32 degrees it was a heat wave . Now most of the team is night skiing – Elizas first time doing downhill , so very exciting . Magical to ski at night . The drive home that’s still coming ? Not so magical ! So I’ve been going on and on about how much I love the snow, but I want to share what it’s like now, too, that we’ve warmed up a little. This is just one of many roofs in town that have fallen in. A vacant grocery store, it’s going to be an even harder sell now. When the water gets into the building and walls the threat of mold is very real. I drove by this 15 minutes after it happened, so sad. We also had a gym roof collapse on an old school, no one hurt, which prompted the closure of our schools for a few more days while the snow was cleared off all the schools and structural engineers went in to assess the safety. This was a normal road 2 days ago – standing water, and no way to get around it. Grateful for 4WD, a must here. The slush in our neighborhood was 12″ deep and I got stuck twice. You’re supposed to take water this deep slowly, but all 3 of the trucks ahead of me took it fast – I missed the pic of the last truck enveloped in water and barely visible. I took it slow and up on the left curb. This road was the only one in town this good! Heaven to drive on it. Note the right side near the wall= there should be a sidewalk there. Our city code is that homeowners and businesses clear their own w/in 24 hours of a snow, but this area never got cleared and students were walking to school on the road many times. Sad, but our city budget is like everywhere else, stretched, and homeowners have been overwhelmed with getting snow off their roofs, fixing frozen pipes, commuting to work with some roads closed – it’s been a busy couple of days. Up close slush that I worked in for an hour to clear out a sign on a listing I have – great boots for this season – I was dry and warm. So it’s not all sunshine in Bend right now, but I wouldn’t live anywhere else! Dan and I went out to snowshoe yesterday , but the path was so beaten down and narrow that we hiked it instead . 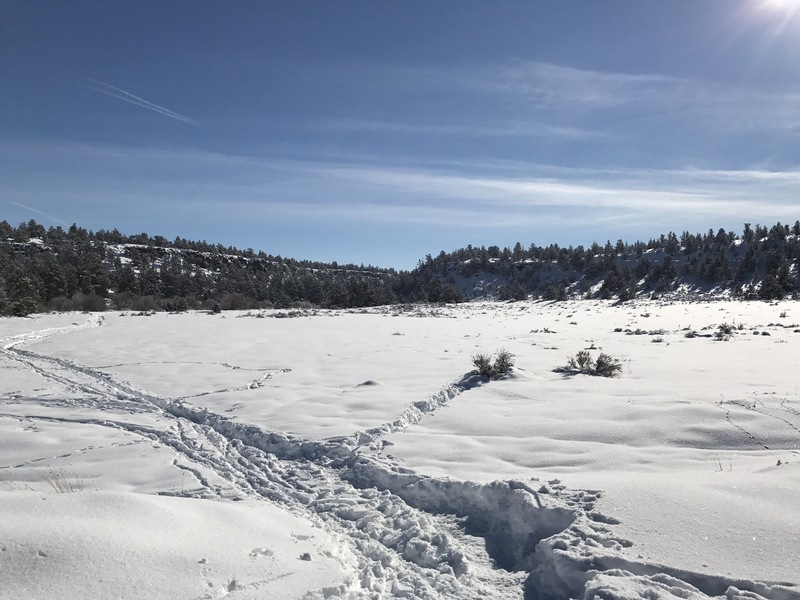 I kept putting a foot down into the soft snow about 12″, and then the next steps would try to be lighter so I wouldn’t go through the top layer . Doesn’t work that way ! Still better than breaking new trail for 90 minutes . 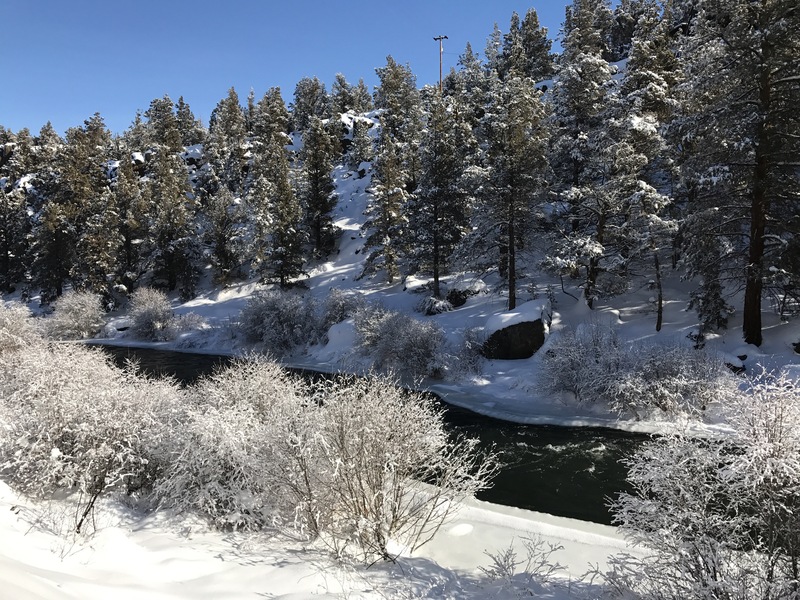 We like this hike year round – along the river . I will never tell exactly where it is ! Hidden . Quiet . Hard to get to . Perfect . The path goes through this big meadow . No sign of wildlife other than a huge hawk that took off the moment I got my camera out . Dan paused on the way back so I could take a pic . Good sport . We swim here in the summer and its beautiful and hot – but this is gorgeous ! Our temps have warmed up a tad,so the ice is breaking off and floating downstream . 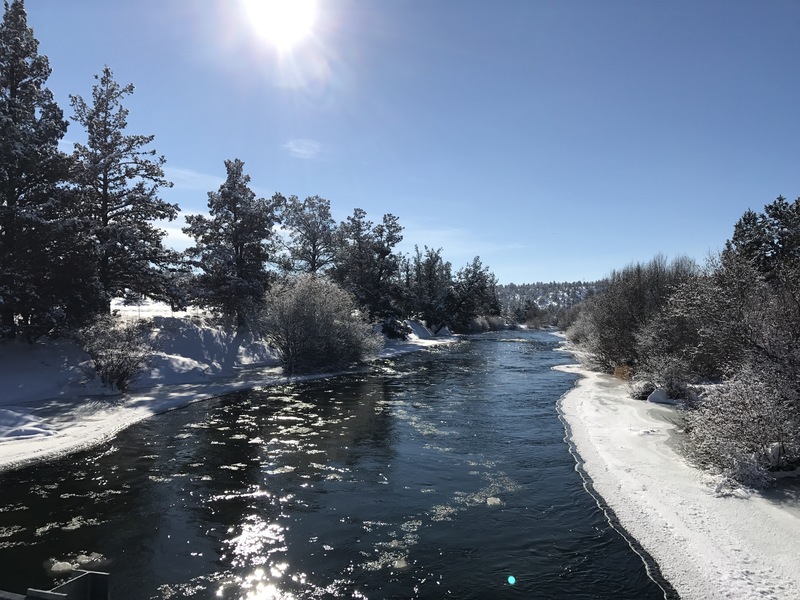 I will say that this is the Deschutes River and today it was very very very cold to the touch . Our afternoon was well spent ! 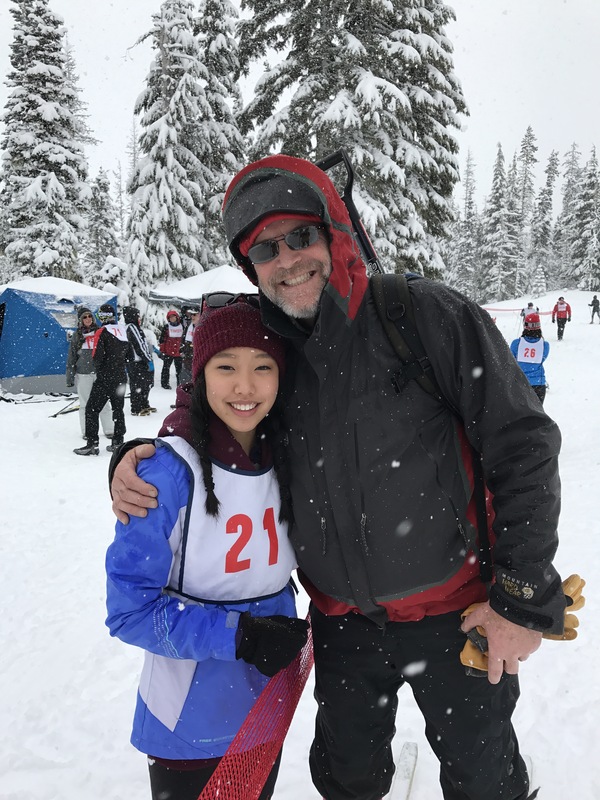 Eliza had a nordic race at Willamette Pass this weekend, and because Nate was injured and couldn’t wrestle, we were both able to go. Here she is coming down the hill during the relay race. Cold, 15 degrees, a little windy, but still beautiful! Odell Lake with Diamond Peak in the background. We’ve camped and hiked on the opposite side of the lake – a very peaceful area. 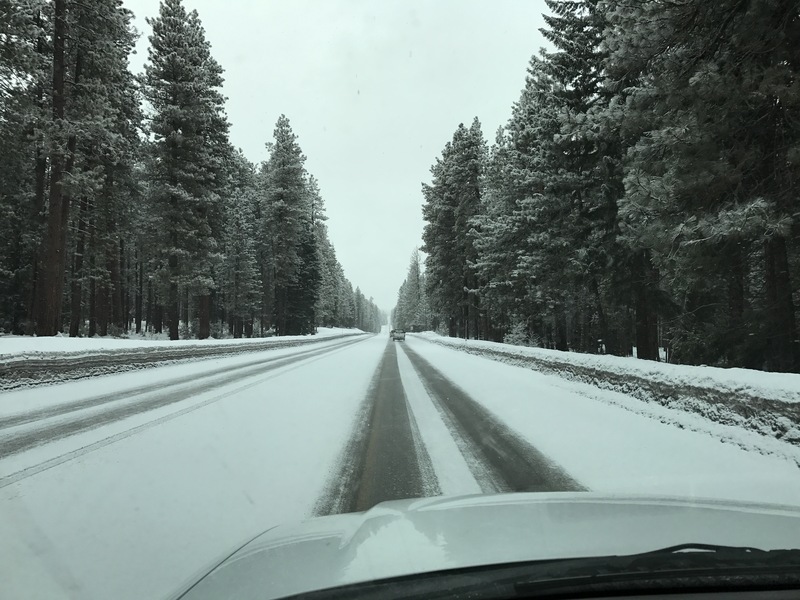 The roads back were fine – that’s ice and snow packed and easy to drive on if you don’t drive too fast! I take this picture every time I come back from LaPine because look at that view!!! Mt Bachelor to the left, then Broken Top and the 3 Sisters. Glad we had the excuse to get outside for Eliza’s race! View from our guest room window – great full moon and color – can you see the mountains just barely over the top of houses? This is how we check the weather! We used to have this view out our front window, but since moving into town, this little peek is all we get. Another beautiful day to hike our “outdoor treadmill” Pilot Butte. View west of Mt. Bachelor to Broken Top to the Three Sisters. You can barely see our little town, too. We’ve had over 50″ of snow in a little over a month, so people are referring to it as Snowmaggeden. 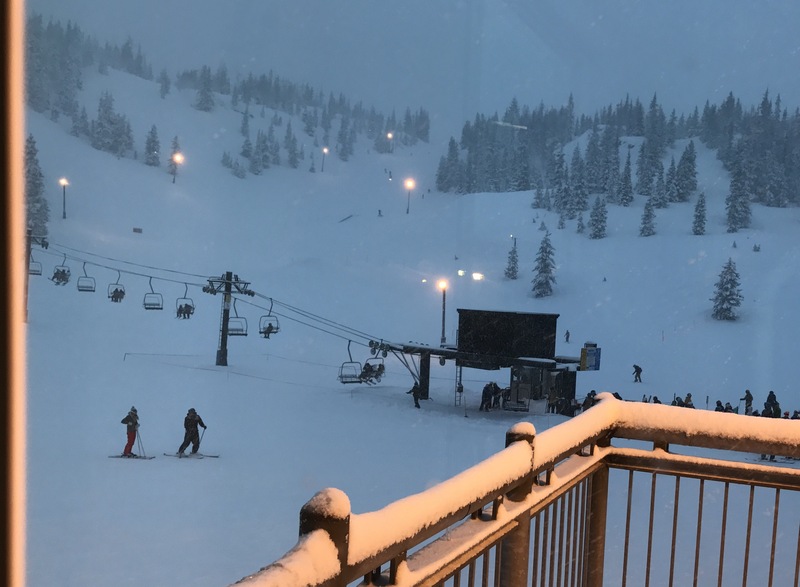 It has had an impact on businesses, including mine, but it mystifies me that people are complaining about it – how can you change the weather?! Just get out and enjoy it. We are to get rain this week and then the flooding may start. That’s our ski mountain, Mt. Bachelor. It’s been very busy up there – locals very happy. Hiking down on the trail, couldn’t resist another pic. Looking up from the base of Pilot Butte, the whole hill is covered with ski tracks. Technically not allowed because it’s a state park, but people have been having fun. Doesn’t it look tiny?! You can google for a better pic. The road that runs up it and is open in good weather is barely visible and locals never drive it, only walk, usually with dogs. I should probably take more time and tell you it’s specs, but I’m heading out to play! Need I say more? Mid-day hike up Pilot Butte yesterday; heaven on earth!